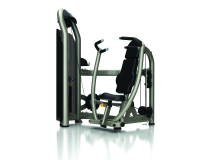 Dual axis of rotation enhances user feel for a natural crunch movement muscle contraction. Seat and handle position designed for greater user stability. Arm pad is angled for stability and limits unwanted shoulder movement during exercise. Optimized pivot location creates a biomechanically correct range of motion, Angled hand grips ensure optimal wrist position. Adjustable non-skid footrests provide secure and proper positioning. 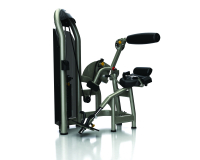 Pivot position promotes the coordinated function of the hip and lower-back muscles. Lower-back reference pad encourages user alignment. Force is transmitted though hips to eliminate spinal compression. 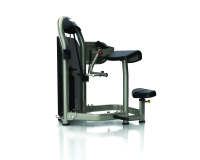 Footplates are curved for comfortable positioning and encourage a full range of motion. Linear bearings allow a smooth, quiet motion and are fully enclosed. 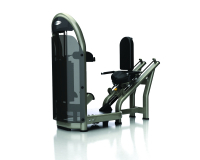 Adjustable pressing arm allows users to determine their own range of motion. Oversized dual hand grips provide greater comfort and variety. Independent converging movement provides a natural path of motion. Dual hand grip positions provide greater training variety. Designed for easy entry and exit. Independent converging movement provides a natural path of motion. 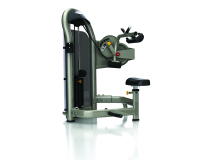 Pressing arm includes both standard and neutral grips for users individual preference. Oversized hand grips provide greater comfort and variety. 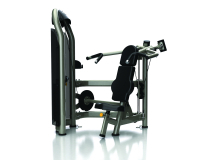 Counterbalanced pressing arm for optimized starting resistance. 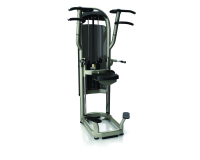 Handles rotate in and out, allowing users to determine the proper exercise position for their shoulders. 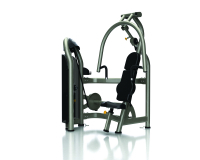 Pull-up bar offers both standard and neutral grips for individual preference, Steps allow easy entry and exit. 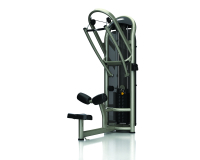 Two sets of pull-up grips allow users of all heights a full range of motion. Independent diverging movement provides a natural path of motion. Angled seat cues optimal user position, Thigh pads easily adjust to provide both stability and comfort.